The Swedenborg and Life panel has reconvened to discuss your questions about God, existence, religion, spirituality, the afterlife, and more! In this episode, host Curtis Childs and featured guests take questions from viewers and provide insights into these matters with the help of eighteenth-century philosopher Emanuel Swedenborg’s spiritual writings. 1. While alive, should we focus on bodily pleasures that we can’t get on the other side? Jonathan disagrees with the premise of the question—there is nothing available on Earth that you can’t get in the spiritual world. Swedenborg talks about two types of pleasures: pleasures that feed the mind, like the joy of solving a problem, and pleasures that come from hell, such as the enjoyment of hurting people. Positive pleasures that help us learn will be even better in heaven than they are on Earth, so Swedenborg might recommend focusing on the long-term pleasures available in the afterlife. This life is not your only chance to live it up. 2. When we dream, are these dreams our own personal visits into heaven or the other side? While some dreams are just our brains working through its experiences, it’s quite possible that others do serve as a connection to the spiritual world. In some cases, it seems like dreams come straight from heaven to enlighten us. Chelsea says that in her experience, sometimes even nightmares contain potent spiritual advice or a deeper truth about her life. 3. 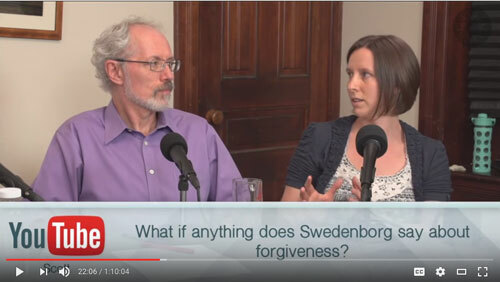 What, if anything, does Swedenborg say about forgiveness? God is forgiveness itself, and Jesus encourages us to forgive each other. Swedenborg says that angels are always looking for the good in people, ignoring the flaws, and that can be a good way to approach a difficult situation. Swedenborg also writes about not only the amazing forgiveness that flows from God but about how we can accept forgiveness for the sins that we’ve committed. To truly do so, we must try to change our behavior. When approaching forgiveness of others, we should remember that resentment and vengeful feelings are characteristics of evil spirits. Even if someone meant an action out of evil, God meant it for good, and focusing on the good can help us forgive. 4. How do you feel about reforming evil/bad spirits? The afterlife is not a punishment machine, it’s a redemption engine. Each spirit is placed where it is most comfortable and then encouraged to move closer to heaven. Chara remembers a line from Swedenborg: “Spirits end up where they can breathe.” Even hell isn’t unpleasant as much as it’s a place where spirits can enjoy the things that they love without harming anyone other than themselves. 5. If our thoughts are a result of spirits when we are in this world, where do our thoughts come from when we are in the spirit world? 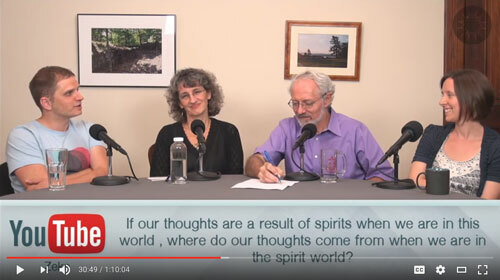 The recent episode “Where Thoughts Come From” examined the idea that many of the thoughts that pop into our head are actually coming from communities in the spiritual world. Swedenborg reports that in the afterlife, everyone’s thoughts are clear to each other—something that can be very hard for a person from this world to get used to! Even there, thoughts are the result of a balance between the levels of heaven and hell, with spirits being drawn toward societies with similar thoughts. 6. Do those who move away from heaven to hell know that they’re in hell? Those in hell can live within their own evil pleasures, and often the life that they think they’re living is an illusion. The light of heaven can break that illusion, but because God is merciful, there are only certain circumstances where that’s allowed to happen. The illusion can be so strong that Swedenborg met spirits in hell who didn’t even believe in life after death! Angels don’t hide the truth of heaven vs. hell from the dying as they make their choice, but sometimes spirits forget what they once knew, especially if what they were told is something they don’t want to believe. 7. The Bible says the dead know nothing and refers to the dead as sleeping, so if the dead know nothing, how can there be spirits watching over us? Swedenborg’s biblical interpretation is based on correspondences, which is the principle that the Bible isn’t meant tobe taken literally; the words often refer to much bigger spiritual concepts. Since Jesus refers to the dead being aware of their lives, Jonathan believes the referenced passage is referring to the spiritually dead—people who have rejected the love of God, whether they are physically still alive or are in the afterlife—knowing nothing about truth. 8. Does Swedenborg mention Mary, mother of Jesus? Swedenborg writes that he encountered her in the afterlife, where she told him that while she knew Jesus as a human, she now understands that her son was the Lord. Swedenborg describes Jesus as the child of a divine father and a human mother. While Mary was clearly a good and spiritual person, in a sense the human side that Jesus received from her was his “dark side,” necessary to completing his spiritual mission on earth. 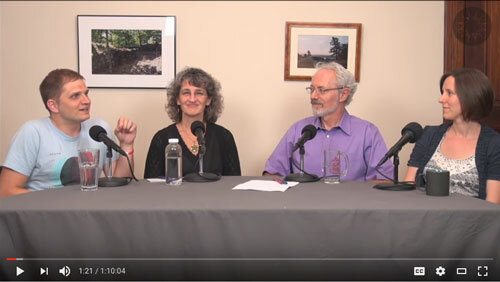 While Swedenborg advocated against worshipping Mary, as some Christians seem to do, the panelists agreed that there’s nothing wrong with venerating her if that brings people to a happier and more loving place. 9. Do we have a choice in what type of angel we become/what community we will join by focusing on different things in our lives? Or do you think the Lord has a plan for all of us? Mix of the two? The Lord created us as unique but infinite beings—even from birth, we have our own individual nature. The Lord created us a container that could grow indefinitely, so we do have free will that allows us to steer our growth. Jonathan compares people to a column of potential: we’re born in a time and place with such a nature that we can choose to pursue different kinds of good or different kinds of evil. The Lord’s plan is for us to end up in the highest heaven, but we have the power to choose how we get there—or to not go there at all. Enjoy this show? Catch up on previous “Spiritual Questions Answered” episodes!